I couldn’t refuse the offer from a friend to join her on an art tour to the Top End led by Wally Caruana. 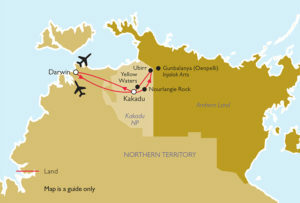 The tour, organised by Renaissance Tours for the Art Gallery Society, was designed around looking at and learning about ancient and contemporary Indigenous art It included the Darwin Aboriginal Art Fair, the National Aboriginal & Torres Strait Islander Art Awards (NATSIAA) at Museum and Art Gallery of the NT, rock art in caves and overhangs in Kakadu and Arnhem Land, and a visit to Injalak Art Centre in Gunbalanya. 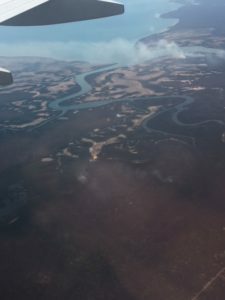 After an action packed five days, covering terrain of concrete, red dust, melaleuca, pandanus and rivers abundant with bird life and crocs (estuarine please, not saltwater), I’ve returned to the southern Big Smoke inspired, excited and humbled by what I’ve seen and learnt. 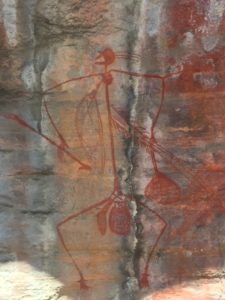 The art, artists, events and venues all affirmed the strength, beauty, diversity and currency of Indigenous art, whether it was made 35,000 years or 3 months ago, and the profound connection Indigenous peoples have to their respective Country. The insights shared by Wally provided the historical, contemporary and cultural frameworks for our group to embrace a more considered understanding of Indigenous art and art making. 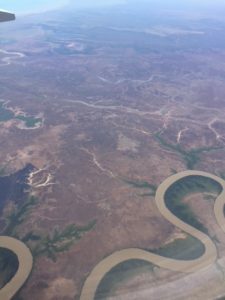 First up, leaving Sydney on the direct QF flight from Sydney to Darwin, there were many other art lovers & seekers, heading to Larrakia Country for the festival of Art Fair and Art Awards, many for the umpteenth time. So the buzz started before we took off. The 2018 Darwin Aboriginal Art Fair was our entrée. 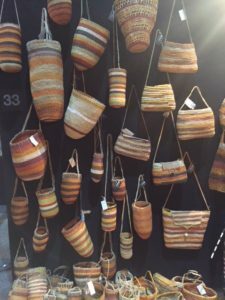 Now in its 12th year, the 2018 Fair hosted some 2,000 artists from 75 Aboriginal and Torres Strait Islander Art Centres across Australia, including a first time inclusion from an artist collective from Launceston Tasmania – Walantanalinany Palingina Artist Collective. 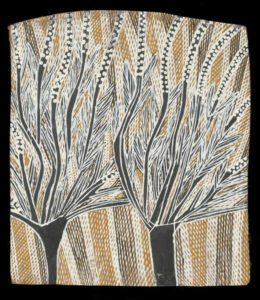 The works ranged from their beautiful contemporary revival of the age-old craft of shell stringing, to Bima Wear from Wurrumiyanga Bathurst Island, to acrylics, ochres on bark and canvas, felted 3d animal objects with emu feathered tufts, woven mats, prints on paper and shirts, bags, bangles from everywhere else. The idea is to bring as many of the Indigenous owned Art Centres under one roof, to showcase the breadth and depth of contemporary Indigenous art and craft making, and create an opportunity for collectors, industry buyers, and art and design aficionados, to look, learn and buy. This is a great opportunity to take advantage of, given many Art Centres are in remote areas that take much determination and commitment to get to. Art Centres are important: they are based in communities, and support and promote the traditional practices, art making and language that belong to each community. Indigenous art is not, and never has been an homogenous expression of culture. What comes out of Buku-Larrnggay Mulka in North East Arnhem Land is increasingly recognised for its adventurous take on use of materials to tell traditional stories and is extraordinary to say the least, is completely different from the energetic paintings from the APY (Anangu Pitjantjatara Yankunytjatjara) Art Centre Collective. These works are entirely different again from, for example, Warmun Art Centre in the East Kimberley’s. 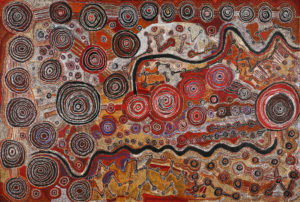 Whilst this may seem like an obvious thing to point out, it is particularly important to understand, as, at their core, the Art Centres seek to ensure the continued expression of the unique stories, traditions, art practices, techniques and materials of the many different communities, clans, groups and nations which comprise First Nations peoples in Australia. They provide quality control, support the artists, manage relationships with curators, collectors and buyers, and ensure fair payment back to the community. 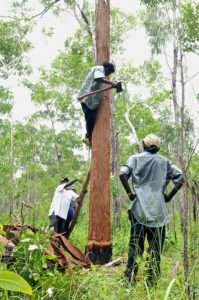 Sometimes this is the only source of income for Indigenous communities. 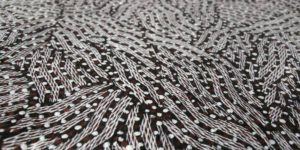 Check out the Indigenous Art Code website for more information on ethical buying. For me, the main event was Telstra National Aboriginal and Torres Strait Islander Art Awards (NATSIAA) hosted by the Museum and Art Gallery of the NT (MAGNT) since 1984. This year’s exhibition of finalists was breathtaking, not only for the quality of the work but for the contemporary expressions of traditional stories. Yolgnu artist Gunyabi Ganambarr, who lives beyond Yirrkala in the Gan Gan community, was the overall winner with Buyku or fish trap, honouring his grandfathers’ stories. 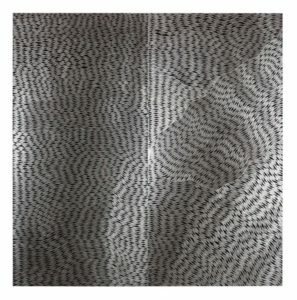 It is a complicated asymmetrical woven design, drill-etched into a large aluminium board. 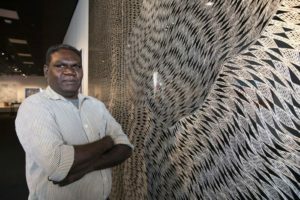 Gunambarr transforms a solid metal panel, material left over from the nearby mines as an alternative to cutting bark off trees, into a shimmering, floating splendour which resonates with cultural significance. It is as much about place, where freshwater meets saltwater, as it is about spiritual ancestors, and their stories and symbols. It is complex yet artfully simple; traditional yet radical in its form; man-made, yet organic in its origins. It is a powerful and deeply moving work of art. 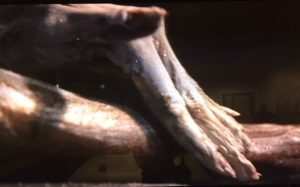 The inaugural Multi-Media Award went to Patrina Liyadurrkitj Mununnggurr, also from Yirrkala whose video ‘Dhunupa’ kum nhuna wanda (Straightening your mind) describes her preparations for ceremony, as she slowly and carefully prepares and paints white clay onto her forehead and limbs. This is a beautiful video piece, intimate, elegant and sparse, which connects traditional practices of her Djapu clan with cutting edge technology. Again, the resulting artwork is compelling. 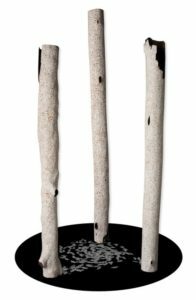 Wukun Wanambi, from Yirrkala, who won the Bark Painting Award in 1998, took out the Wandjuk Marika Memorial 3D Award with his sculpture Destiny, a trio of ochre painted stringybark poles which surround a video of swirling fish projected on the floorspace in between. Wukun Wanambu Destiny natural pigments on stringbark pole with video. Image credit Fiona Morrison. Courtesy the artist and MAGNT. Old is retold via new technology: the fish are sea mullet, Buku-Dungulmirri or Wawurritjpal, and are swimming around and around, “They are looking for their destiny, just like you and I tracing our family tree on a computer, looking for our great great grandfathers and grandmothers”. Wukun’s acceptance speech was memorable in that it was all about sharing – of culture, stories and land. Not what you would hear at the Archibald’s. And I loved the sharply ironic take on our Coat of Arms by Niningka Lewis, one of the renowned Tjanpi Desert Weavers based at Ernabella Arts in SA, Australian Coat of Arms: we were there and we are here. Woven with locally found materials, rather than cast in bronze or embroidered in gilt thread, Niningka’s work speaks to sovereignty and traditional ownership, strength of culture and the abundance offered by the land. 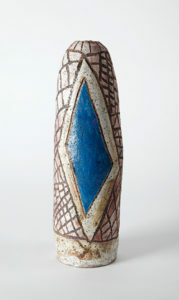 She is adept across many art forms, as a painter, ceramicist as well as weaver. 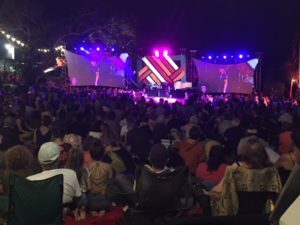 Darwin embraces these Awards with respect and enthusiasm: there were over 3,000 people at the prize announcement ceremony, hanging out on a balmy evening enjoying picnics and the entertainment. 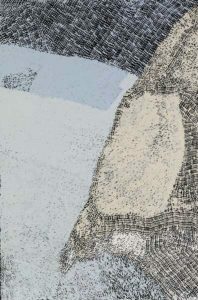 The local art scene pulls out all stops to bring together companion exhibitions: a Salon des Refuses exhibition of runners up at the Charles Darwin University Gallery, a large Tiwi exhibition in a local hotel and the outstanding Salon Art Project series at Paul Johnstone Gallery, The Outstation and a pop up gallery in Searcy Street. The Salon exhibitions particularly, offered opportunities to view artists who were finalists in the NATSIAA’s, in greater depth. When too much art is barely enough! The solo exhibition of recent work by Pepai Jangala Carroll at The Outstation was well timed. His entry to the Telstra’s was a standout. 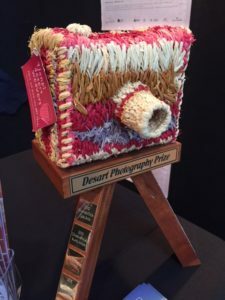 Yumari was inspired by Pepai’s return journey to his father’s country west of Walungurru (Kintore, 500km west of Alice Springs), the first time since he was a young boy. 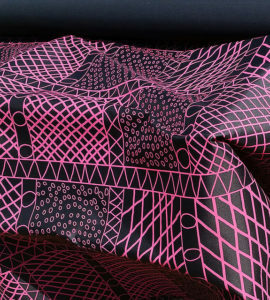 I was seduced as much by the dreamy soft pink swirls and a striking black cross-like shape articulating a most significant personal site, as I was moved by the intensely moving story. 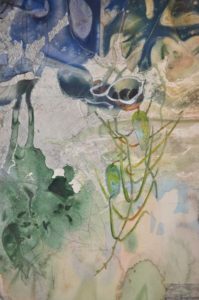 The exhibition at The Outstation showed more from this journey and more of his prowess across different media – paintings in range of pastel blues, greens and yellows, and large glazed ceramic vessels. At the Searcy Street pop up, in association with Buku-Larrnggay Mulka Centre (Yirrkala), were works from another Yolgnu artist Barayuwa Munungurr, also a Telstra finalist. Barayuwa paints his own Djapu designs on bark and poles, and his mother’s Munyuku clan designs from her ancestral home near Blue Mud Bay. The intricate, delicate markings simultaneously describe and camouflage the ancient yet constant stories of the whale Mirinyunu at Yarrinua (Point Blane). Paul Johnstone Gallery showcased APY Lands (north western SA) Elders, Taylor Cooper and Witjiti George, good friends who often sit with each other when working. More traditional designs, symbols and palettes but with great energy characterised these recent works, particularly the collaborative piece – Malari and Piltardi. 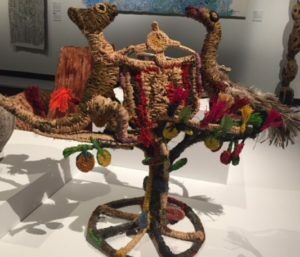 And just quickly, though it deserves greater consideration, was the touring exhibition Midawarr/Harvest: The Art of Mulkun Wirrpanda and John Wolseley at MAGNT of paintings and drawings by these two senior artists. In 2009, Mulkun adopted Wolseley as her ‘wawa’ (brother) and in the following years they harvested, painted and illustrated over 40 species of edible plants. The exhibition gives visitors an insight into the special relationship between these two artists, and ancient Yolŋu knowledge of sustainable living. Mulkum Wirrpanda. Galurra ochre on bark. Image courtesy the artist and MAGNT. In a way, what we’d tasted in Darwin was just whetting our respective appetites for more. 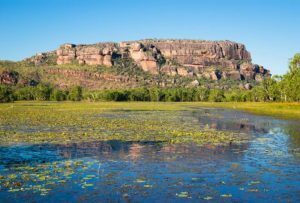 The next art destinations were about stepping back in time and visiting ancient rock art sites in Kakadu, then Arnhem Land: Ubirr and Burrunkuy (formerly known as Nourlangie). 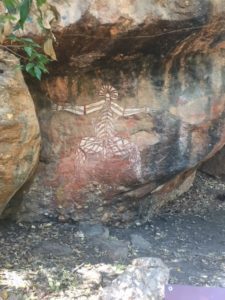 Both sites, managed by National Parks in partnership with the Traditional Owners, have been made easily accessible to the public as thousands visit in the dry season to view them. 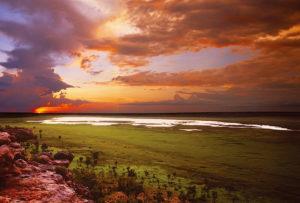 Ubirr at sunset. 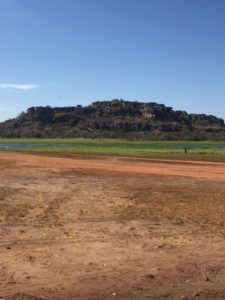 Kakadu National Park. Image credit Peter Eve NT Tourism. 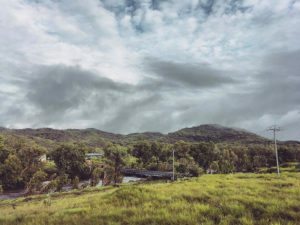 View to Burrunkuy from Angbangbang Billabong Kakadu. Image courtesy Renaissance Tours. The ochres paintings are in overhangs and caves, places where people would have stayed to shelter during the wet. 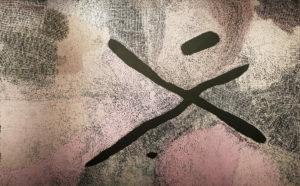 The images are of what was observed around them, such as the remarkable image of a thylacine and a more recent European style sailing ship from first contact ; markings for “I was here” like the hand silhouettes and outlines; and, characters from Dreaming stories – Mimih spirits, Namarrgon (lightning man) – teaching stories of behaviour and law. It is a humbling experience to stand before hard evidence of a sophisticated culture which lived in and with such an extreme landscape for over 60,000 years. 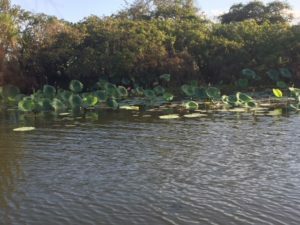 Together with a couple of locally guided river cruises, one venturing through a floodplain at sunset, the other a tidal river, we got a glimpse of what it takes to ‘read’ the landscape, the seasons, the animal and bird life and the inherent, all pervasive spirituality, in order to survive and thrive in it. Thank you to Wally Caruana who guided us through this inspiring experience and who so very generously shared his insights and wealth of knowledge about Indigenous peoples and their art. His book Aboriginal Art published by Thames & Hudson as part of their World of Art series is a comprehensive introduction to Indigenous art and highly recommended authoritative reference. 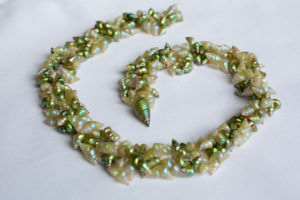 The 35th Telstra NATSIAA exhibitions is on until 25 November. The rock art at Ubirr and Burrunkuy will be there hopefully for eternity, but, may I suggest, don’t wait that long. What an incredible experience, getting close up to the landscape, the Art and the community. Thank you for documenting our trip so warmly and intelligently. I now have something to go back to everytime I wish I was still there. What a wonderful summary of our trip. Brings back a rush of memories. Fiona – This is such an evocative description of your travels north. Just wonderful! Great trip Fi! You write with such verve – it’s palpable. And so informative. I feel I’ve been on the journey with you! Such a great trip. How lucky we are to live in this amazing country. Thanks for sharing your inspiring trip Fi. Amazing! Fiona – such evocative writing, insights into a rich, cultural experience and ways of seeing. 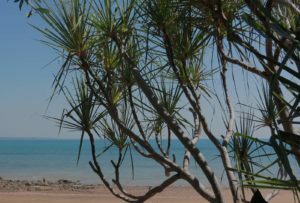 Hi Fiona, great article…reminded me of my visit to Darwin and Telstra Awards etc – such a revelation when you visit for the first time. I really like the work of Pepai Jangala Carroll (as seen from your images) and the Midawarr/Harvest exhibition is one I hope will travel south. 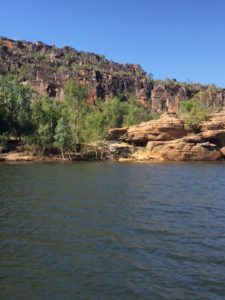 Fantastic blog Fiona, you have inspired me to get my act together and visit NT. What an amazing experience. What a fabulous trip, Fi and a wonderful read, thank you.